There are a variety of over-the-counter Tylenol (acetaminophen) products to choose from, so it may not always be clear when you head to the drugstore which might be best for your symptoms or condition. 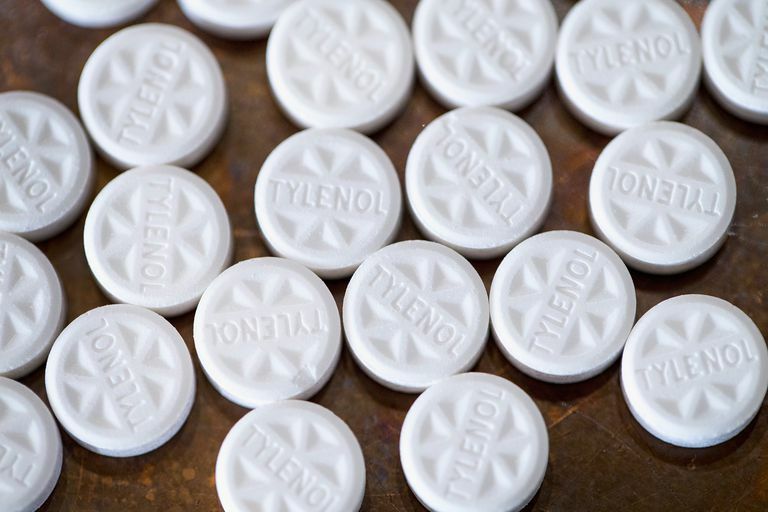 Regular Strength Tylenol contains 325 mg acetaminophen per tablet/capsule. Adults and children 12 years and over can take two tablets/capsules every four to six hours as needed, but no more than 12 tablets/capsules in 24 hours. Extra Strength Tylenol contains 500 mg acetaminophen per tablet/capsule. Adults and kids 12 and over can safely take two tablets/capsules every four to six hours as needed, but no more than six tablets/capsules in 24 hours. If you're using Extra Strength Tylenol, don't take it for more than ten days in a row unless your doctor says you should. Tylenol 8 Hour Arthritis Pain contains 650 mg acetaminophen per caplet. Although it's marketed for arthritis pain, it also can bring temporary relief for more general muscle aches, back pain, menstrual cramps, discomfort from a cold or flu, and toothache. It has a double layer design: The first layer provides fast relief and the second offers continuous all-day relief in an extended release formula. Because the first layer is meant to dissolve quickly for immediate relief, this particular form of Tylenol should be swallowed whole with water. Adults can take one to two caplets every eight hours, but no more than six caplets in 24 hours. Tylenol 8 Hour Aches and Pains Extended Release is basically the same as the formulation for arthritis pain: it contains 650 mg acetaminophen per caplet, has the same bi-layer design, and is formulated to relieve minor muscle aches and body pain fast and to last all day. Adults and children 12 years and over can take two caplets every eight hours, swallowed whole with water, and no more than six caplets in 24 hours. Tylenol products designed to help relieve cold symptoms or sinus discomfort contain another active ingredient, phenylephrine, which relieves congestion by shrinking blood vessels in the nasal passages. The reason it's important to know how much acetaminophen is in each Tylenol product and to follow the dosage directions carefully is that there's a very real danger of severe liver damage from taking too much acetaminophen at one time. This seems straightforward, but it can be tricky. There are non-Tylenol medications that contain acetaminophen—for instance, some prescription narcotic pain relievers contain acetaminophen in combination with another ingredient, so if you're taking one of these it's important to not take OTC Tylenol at the same time if it will put your daily dose over the maximum allowable daily dose recommended by the U.S. Food and Drug Administration (FDA ). According to the FDA, adults should not take more than 4,000 milligrams (mg) of acetaminophen in a 24-hour period. The safe daily dose for children under 12 is 90 mg. Keep in mind that you also risk liver damage if you drink too much alcohol while taking a medication that contains acetaminophen. The FDA warns you shouldn't have more than three or more drinks per day. There's one more thing to think about when taking Tylenol: your weight—especially if you're under 150 pounds. A 2015 Harvard Health Publication stated, "The maximum daily dose for a healthy adult who weighs at least 150 pounds is 4,000 milligrams (mg). However, in some people, taking the maximum daily dose for extended periods can seriously damage the liver. It's best to take the lowest dose necessary and stay closer to 3,000 mg per day as your maximum dose. If you need to take high doses of acetaminophen for chronic pain, check with your doctor first." Harvard Men's Health Watch. "Acetaminophen Safety: Be Cautious But Not Afraid." October 9, 2015. Which Analgesics Provide the Most Relief for Arthritis? Can Topical Creams Help Your Arthritis Pain?